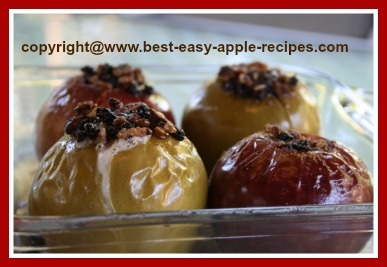 If you are looking for the best Oven Baked Apples Recipe, you have found it here! 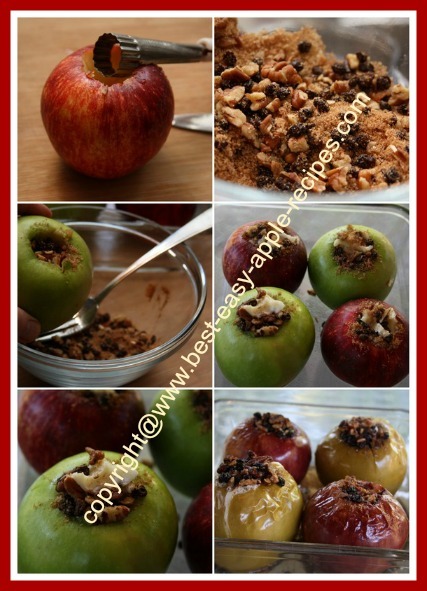 I just made these stuffed apples in the oven for dessert, and they turned out amazing! This really is a very simple and quick dessert idea with apples. I can't wait to make this simple dessert recipe again! Whether the apple season is just beginning, or in full-swing, a warm apple dessert (or snack), is a cozy, comfort food favourite for Fall! And for those of you who like to eat your apple with the peel on ... like most of us ... these baked apples have the skins left on! Wash apples and core each apple to about 1/2 inch from the bottom of the apples. Use an apple corer (if you have one) and/or a knife. Trying to remove only a portion of the core may require a little help with a paring knife to make the opening a little larger. Spoon out the seeds, and make sure the holes are about 3/4" to 1" wide. In a small bowl, combine the brown sugar, cinnamon, currants or raisins and the pecans. Place the prepared apples in an 8" square baking dish. Stuff each apple with this mixture. Top with a dot of butter. Add boiling water to the baking dish. 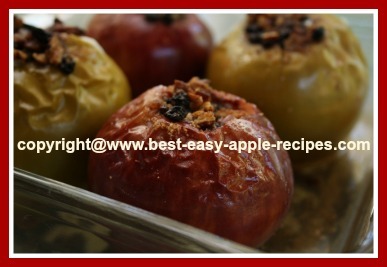 Bake apples for about 50 minutes, or until apples are tender, but not mushy. 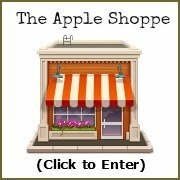 The exact time required for baking the apples may vary according to the variety of apple. Remove from the oven, and baste the apples several times with the pan juices. 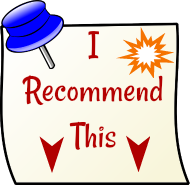 *Note - when I make this recipe I always have left-over apple stuffing ingredients. 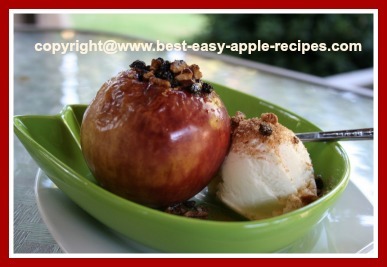 There is definitely enough filling to make at least 6 baked apples using this recipe.